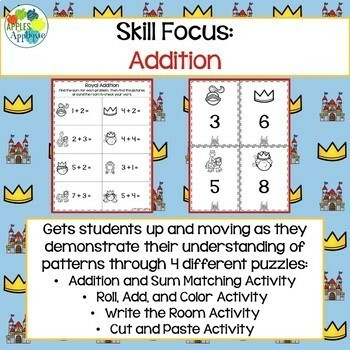 An addition game combined with a breakout activity designed specifically for Pre-K and Kindergarten! 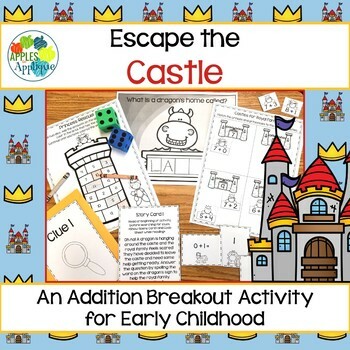 This fun castle-themed escape game provides the perfect chance for students to practice addition skills. 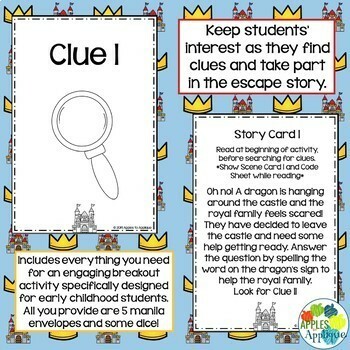 Get them up and moving as they work together to try to help the royal family escape the castle! Easy setup with clear instructions. All you need to provide are 5 manila envelopes and some dice—no fancy locks or boxes required! 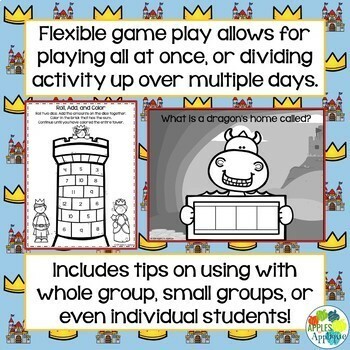 Flexible game play! Tips included for using as a whole group, with small groups, or even individual students. Escape Room: Apple Cider Stand! Escape Room: 100th Day of School! Escape Room: Chinese New Year! Escape Room: Saint Patrick's Day!